Once again an apology for the tardiness of this post – just when we start to take wi-fi for granted, we hit several black holes in the internet world! It’s certainly been quite a week spent exploring the inland regions of the central Alentejo region: a magical area of dry golden wheat fields, scattered with cork trees and broken up by bright green vineyards. 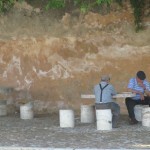 The whitewashed villages were sleepy in the summer heat (it’s been in the high 30s and low 40s here), filled with old men sitting on benches watching the world go by. Driving through these villages with Bambi in tow certainly caused heads to turn and we knew we would be the talking point for some time! Sadly Brenda has now left us, so it’s back to life on the road alone, but at least her return to SA was cheered up by the excitement of the Grahamstown festival. 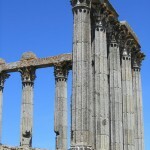 We stayed initially in Evora, a beautifully preserved medieval town which is a UNESCO world heritage site. Unlike other medieval towns and villages we’ve visited, Evora has a wonderful sense of space; winding cobbled streets opening on to large tree filled squares, beautiful public gardens and magnificent gothic churches and cathedrals. My best moment was wondering past a 17th century palace and turning the corner to be confronted unexpectedly by the best preserved Roman temple on the Iberian peninsular. 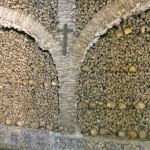 Another must see in Evora is the Capela dos Ossos, the Bones Chapel, constructed in the 17th century as a memento mori. 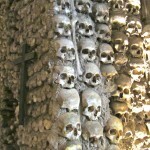 The inscription over the entrance reads “Nos ossos qui aqui estomos pelos vossos esperamos” – which roughly translates as “our bones are here, for yours we wait” and is lined with the skeletons of some 5,000 people (whose bodies were dug up from the local graveyard in the early 1600s). We were also amused by the setting of some well preserved Roman baths, located in an abandoned room within the town hall complex. 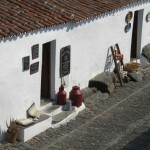 We were also lucky enough to organise a morning in nearby Alvito, learning how to make traditional Portuguese bread. We were hosted in a local rural guesthouse, Horta do Padre (a beautifully restored traditional farm house, formerly owned by the local priest), by Fernanda and Lino and were taught how to make gorgeous loaves as well as rolls stuffed with chorizo and with walnuts by a local Portuguese equivalent of Granny Lisk, Dona Luisa, who had been making bread since she was a young girl. Sadly Dona Luisa and her husband (who was a real chatterbox) didn’t speak any English, but we got on fine with hand signals and translations by Fernanda. After nearly half an hour of kneading (Dona Luisa was rather unimpressed by our efforts and frequently took over from us!) and having used no recipe but merely added flour and water until the right consistency was reached, we left the dough to rise and walked out to the nearby Hermitage de Santa Luzia. 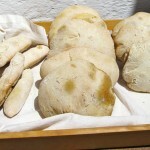 The bread was baked in the farm’s outdoor wood fired bread oven, which was enormously hot and cooled down by Dona Luisa sweeping it with a wet brush of denim strands, known as a “beard”. At the end of the morning we all sat down to a delicious meal of local olives, cheeses, olive oil and of course the amazing hot bread and were sent on our way with loaves of bread and bottles of the local olive oil. What a wonderful experience! 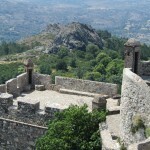 Alvito itself is charming, with fresco-filled churches and a large castle which is now a beautiful hotel. Finally (after LOTS of kneading) they’re ready to go into the oven! We spent another day in Lisbon (and yes, we did return to Belem to have more of those amazing pasteis de nata!) before dropping Brenda at the airport and returning to Evora. Prior to saying our goodbyes at the airport we got lost in the streets around the cathedral, took a clattering tram ride and soaked up the atmosphere of the most laid back capital city we’ve yet visited. 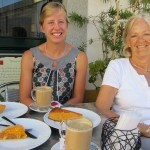 The following day we explored the surrounds of Evora in the early morning on the bikes (the heat is a very good reason to get up and out early! 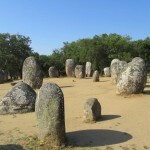 ), visiting a series of Neolithic megaliths, erected between 5000 and 6000 years ago, that are scattered in the countryside around Evora. 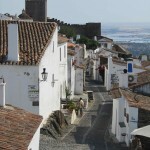 We also drove out to the delightful hilltop village Monsaraz – inhabited now by just 50 people, it is quite magical: surrounded by thick walls with a castle on one end, the few cobbled streets contain tumbledown whitewashed houses and two beautiful churches, as well as magnificent views over the surrounding olive groves and vineyards. 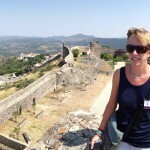 We really fell in love with it and, after going down to a nearby dam to swim and cool off, returned to Monsaraz for dinner at a tiny local restaurant to watch the sun set over the vines and olive groves. From Evora we headed eastwards to Elvas, another hilltop town and the most fortified we’ve visited so far, owing to its proximity to Spain. The town walls are incredible, comprising forts on several sides, a moat (now disused) and incredibly thick walls. Unsurprisingly, given the immense fortifications, in the 1600s Elvas was able to hold out against the Spanish and in one battle just 1,000 Portuguese soldiers withstood attack by Spain’s 15,000 strong army. WIthin the town walls, the residential areas seem little changed since Moorish times, the winding narrow alleyways and myriad of dead ends and tiny passageways reminding us of the medinas we had explored in Morocco. 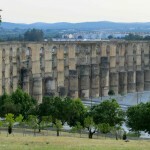 Also impressive is the huge multi-tiered aqueduct built in the 1600s brings water to the town squares. 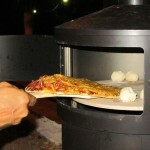 Hurrah – homemade pizza and dough balls in the Aquaforno! We also explored Marvao, a small village nestled in craggy mountains close to the Spanish border, so also heavily fortified with a huge castle. 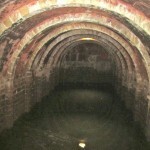 The most unusual feature of the castle is a giant cistern, built to store water, which could hold enough water for 6 months if required if the village were under siege. We spent a leisurely afternoon, strolling the village streets, dipping our feet in the water features to keep cool and enjoying the laid back vibe. We’ve now moved north west, into the heartland of Portugal and are at a small rural campsite, which came highly recommended by several people we’ve met along the way, just outside Tomar.